Auburn, AL (RestaurantNews.com) Chicken Salad Chick, the nation’s only southern inspired, fast casual chicken salad restaurant concept, announced today it will be expanding in Georgia with its first location in Carrollton. Located at 1765 Hwy 27 South, the new restaurant, which features a drive-thru, will open on August 7th and marks the 22nd location in the state. The opening of the Carrollton restaurant kicks off a string of continued development in Georgia with restaurants in Sandy Springs, Sandy Plains and McDonough slated to open later this year. Thursday, August 9 – Craving Credits Day – Any guest that signs up for the loyalty app will receive double points on any purchase and a special keyword reward. Friday, August 10 – Free Upgrade Friday – The first 100 guests to purchase the Chick will receive a free upgrade to a Chick Trio. Saturday, August 11 – The first 50 guests to purchase 2 large Quick Chicks will receive a free large Chick cooler. The Carrollton restaurant will be owned and operated by industry veterans and Chicken Salad Chick franchisees Lanier and Rod McLeod, who opened their first restaurant in Warner Robins, Georgia in 2016. The new location in Carrollton will be the McLeods third restaurant throughout the state, with plans to open an additional Chicken Salad Chick location in Macon in the next couple years. Prior to Chicken Salad Chick, Lanier and Rod were part owners of a Zaxby’s franchise, but decided to diversify their portfolio after experiencing the high quality flavors of the brand’s homemade chicken salad. The McLeods fell in love with the Southern culture and unmatched dining experience, fueling their continued expansion with Chicken Salad Chick. 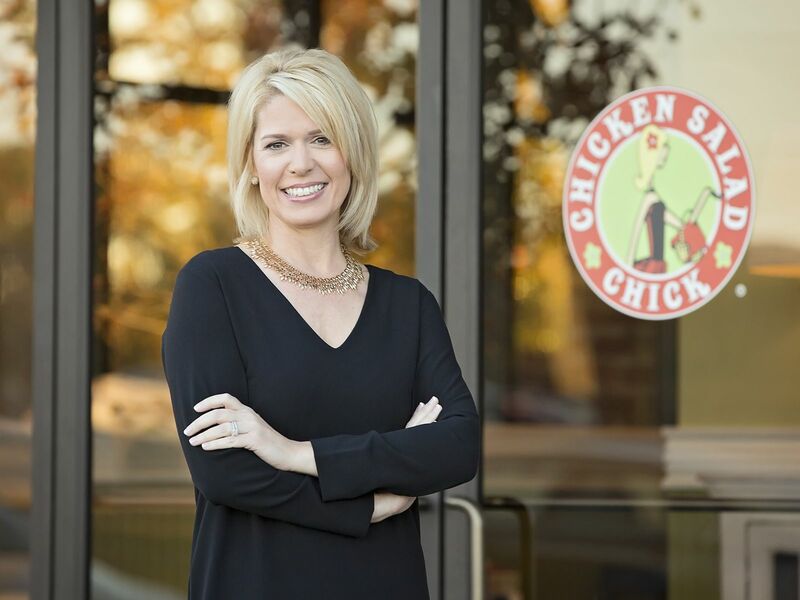 The Chicken Salad Chick concept, born in Auburn, was established in 2008 in the kitchen of founder, Stacy Brown. When Stacy discovered that the local county health department would not allow her to continue making and selling her delicious recipes out of her home kitchen, she overcame that obstacle by launching her first restaurant with the business expertise of her future husband and fellow founder, Kevin Brown. Together, they opened a small takeout restaurant, which quickly grew; the company now has 91 restaurants across the Southeast. Chicken Salad Chick in Carrollton will be open Monday – Saturday from 10:30 a.m. – 8 p.m. For more information, visit http://www.chickensaladchick.com or call (678)-664-0555. Follow Chicken Salad Chick on Facebook, Twitter and Instagram for the latest news and trends. * Eligible winners must be over 16 years of age, purchase The Chick and are required to download the Craving Credits app. Redemption will start 8/13. Giveaways are in-store, not available in the drive thru. ** 10 winners will be drawn at closing on grand opening day and announced via Facebook live. Winners will receive 1 large Quick Chick per month for the next 12 months. Must make a purchase to enter. Giveaways are in store, not available in the drive-thru. Founded in Auburn, Alabama, in 2008, Chicken Salad Chick serves full-flavored, Southern-style chicken salad made from scratch and served from the heart. With more than a dozen original chicken salad flavors as well as fresh side salads, gourmet soups, signature sandwiches and delicious desserts, Chicken Salad Chick’s robust menu is a perfect fit for any guest. Today, the brand has more than 90 restaurants in 9 states and is continuing its rapid expansion with both franchise and company locations. Chicken Salad Chick was recently named as one of FastCasual.com‘s top Movers and Shakers and one of Nation’s Restaurant News 2017 Next 20 brands. The brand also ranked #37 on the 2016 Inc. list of the 500 fastest-growing companies in the U.S. See www.chickensaladchick.com for additional information.